RULER STOP: Ruler stops are super handy devices that magnify the usefulness of any steel ruler by providing an easily repositioned stop ideal for repetitive layout work. With a ruler stop you can now convert any steel rule into a precision marking tool. 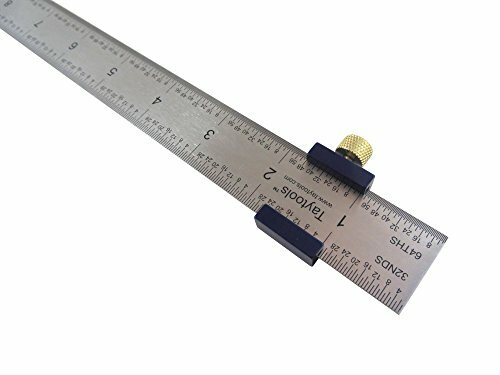 The knurled solid brass knob allows quick adjustment to anywhere along a ruler's edge, and when locked down, will hold measurements securely. Body is made from anodized aluminum and will provide years of accurate performance. Will accept rules from 0.900" to 1.00" wide and 0.05" thick. Overall size is 1.5" x 875" x 0.350. MACHINIST RULER: 12 inch rigid machinist rule made from hardened spring steel. Blade is .040" thick and 1" wide. Both sides of the blade are ground parallel and straight. Rule is precision photo etched and black filled for long life and easy readability. Graduated with quick reading 1/8" and 1/16" increments on one side and 1/32" and 1/64" on the other side. Brushed finish. Will accept rules from 0.900" to 1.00" wide and up to 0.050" thick. Overall size is 1.500" x 875" x 0.350"
If you have any questions about this product by Taytools, contact us by completing and submitting the form below. If you are looking for a specif part number, please include it with your message.